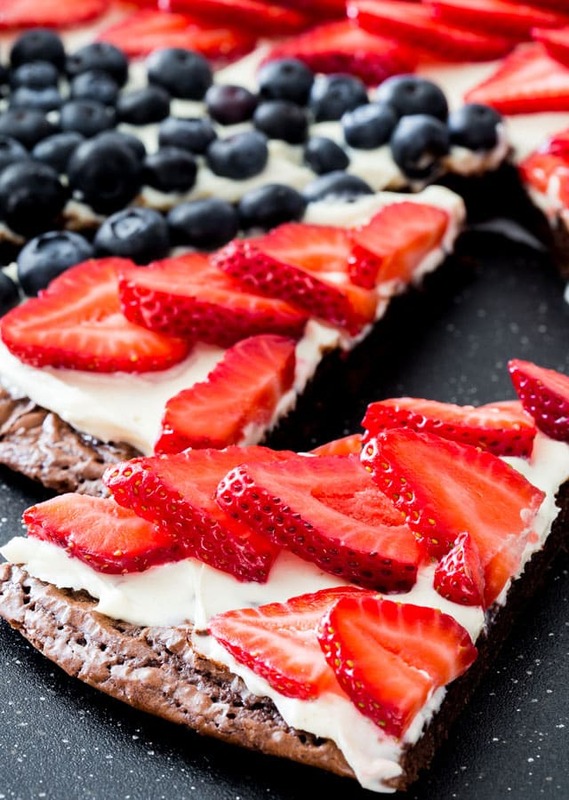 Red White and Blue Brownie Pizza – the perfect dessert for your 4th of July celebration. A delicious brownie crust topped with a cream cheese frosting and loaded with berries! Yes, I know I’m Canadian, but I worked in the states for 10 years, so I think that allows me to celebrate 4th of July. Plus we used to live right by the Detroit border and every year Windsor and Detroit celebrates 4th of July and Canada Day together with the biggest and best fireworks display! Thousands and thousands of people gather by the Detroit river to watch the best fireworks of the year. I have to say I really miss that. Even if we didn’t go to see them every year I could certainly hear them from my house and would always watch them on TV. 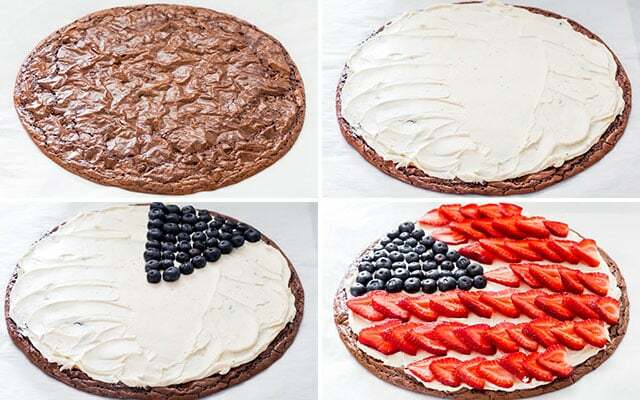 So this year I decided to make a red white and blue brownie pizza as a tribute to my 10 years of working in the US. The last fruit pizza I made was really successful at my house. I have to say the brownie crust is my favorite though, it’s chewy it’s chocolaty, it’s just yummy. What’s not to love about brownies, cream cheese and berries. You can’t go wrong! 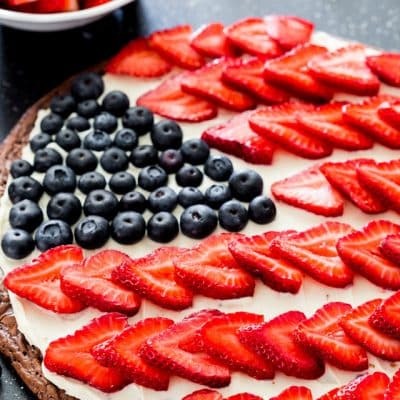 Now we can definitely turn this into a brownie pizza for Canada day, just replace the blueberries with more strawberries, maybe in the shape of a maple leaf, and voila! This dessert is super easy to make too. You know I love to take shortcuts, so I used a store bought brownie mix and I’m glad I did, because in 2 minutes my brownie crust was baking in the oven. That cream cheese frosting is also super easy to make, just 3 ingredients, sugar, vanilla extract and cream cheese, beat the crap out of it until it’s nice and smooth. And all that’s left to do is assemble it. It’s so easy, your kids could put this pizza together. Then all that’s left to do is eat! If you try this recipe, please let us know! Leave a comment, rate it and tag a photo #jocooks on Instagram so we can see it. I always love to see what you guys come up with! 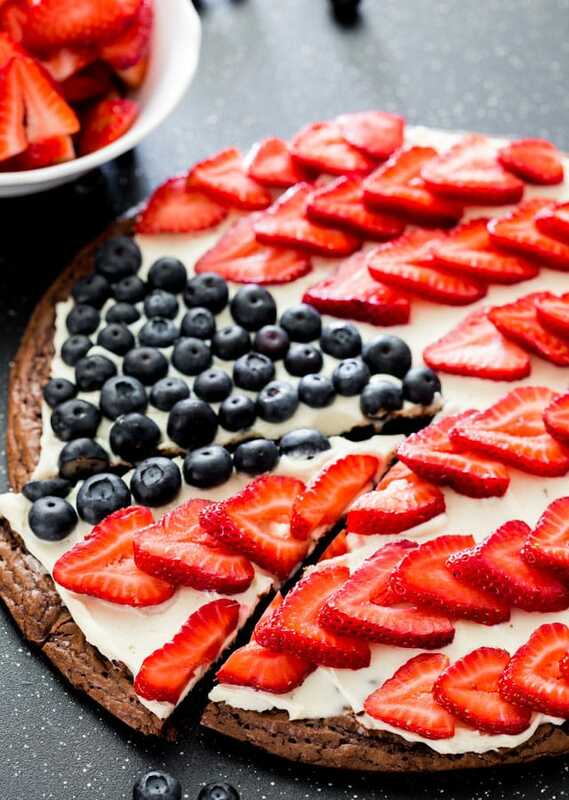 Red White and Blue Brownie Pizza - the perfect dessert for your 4th of July celebration. A delicious brownie crust topped with a cream cheese frosting and loaded with berries! Preheat oven to 350 F degrees. Prepare a pizza pan or a large cookie sheet with parchment paper. In your mixer add all the brownie ingredients and and mix just until everything is well blended. Spread the brownie mix over the parchment paper to form a circle that's about 14 inches in diameter. Bake for 20 minutes. Let it cool completely. In your mixer add the cream cheese, sugar and vanilla extract and mix well until smooth. Using a spatula spread the cream cheese mixture evenly over the brownie crust. Arrange berries over the cream cheese mixture. Slice and serve. Refrigerate leftovers. Hi Jo, this was easy as pie (haha). The only slightly tough part is the placement of the “stars and stripes” but it came out exactly as in your photo. Took it to my son’s July 4th BBQ and it was seriously the culinary hit of the whole party. It looks great and tastes delicious. Wow wow wow. I’m not much of a baker but I stole the show thanks to you! Would love to post the my photo but couldn’t figure out how to do that. That sounds fantastic! We’re so glad to hear it was a hit. You can post a photo in instagram and tag us @jocooks! I made this for the fourth of July, and it tasted even better than it looked! I highly recommend this recipe. The brownie was quite runny and spilled a little bit off the cookie tray; next time I’ll use something with a small rim. Essa receita é muito boa, e bem diferente também é bom para fazer para as crianças elas irão gostar demais. I know someone asked this already but can you confirm if I use confectioners sugar or granulated? Thanks! Jo – do you use granulated sugar or confectioner sugar for the frosting? I know I’m late to the party, but is the brownie crust sturdy enough that you can eat this like a pizza? Or will it bend under the weight of the fruit? Yes you can eat it like a pizza. Its not as strong as a pizza but you can hold it…..thats half the fun…. Can you make this the night before an event and it will be ok in the fridge? Made it today for an event and it turned out well! 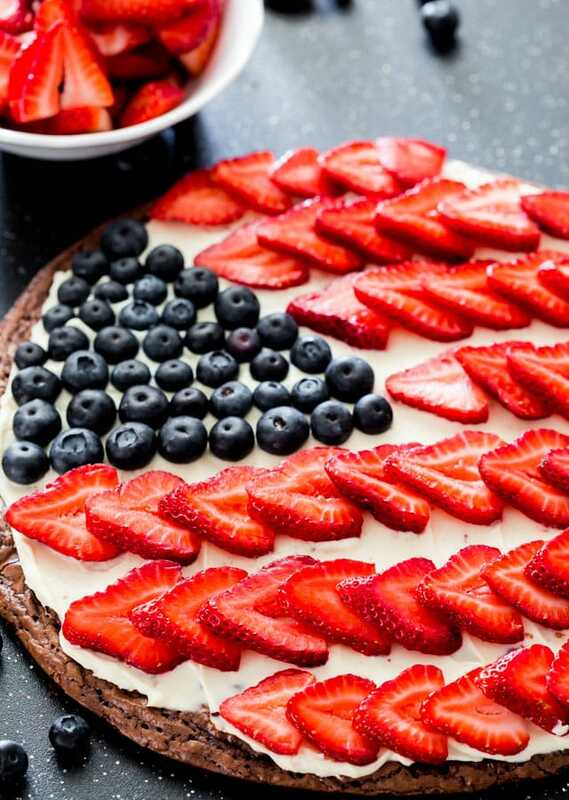 This is so perfect for Memorial Day and the 4th of July…I am loving this! I’m the only chocolate lover in my family, is going to try this with a sugar cookie recipe. My family doesn’t care for Cream cheese frosting. Any suggestions? You could I suppose just make a regular frosting, or even just whipped cream. Great idea and beautiful plating Jo!